Hook, the film that taught an impressionable, younger me to never grow up. Which told me that if I just think happy thoughts, maybe, just maybe, I could fly. And that starred Dante Basco’s Rufio, a kid who made me dream of one day rocking a triple mohawk. A dream that, alas, never came true, and barring a miracle regrowth of hair, never will. But most importantly, it’s a film which myself and many others hold near and dear to this day. If I took just one lesson away from Hook, it’s that living is a grand adventure. The Lost Boys, then and now. “Hook is overwhelmed by a screenplay heavy with complicated exposition…” NY Times. “The exposition is so underlined and re-underlined, you could teach yourself to fly waiting for something to happen.” Washington Post. You get the idea. Lots of exposition, a heavy script, and a middle-aged Peter Pan doesn’t make for exhilarating cinema. Yet many reviews also tend to gloss over the massive heart of Hook, it’s unrelenting energy, the wonderful John Williams score, the bundles of spectacle, and the amazing, hand built, large-scale sets, along with the set pieces they stage. Admittedly, I’m looking back on the film with a big dollop of nostalgia, but it caught my imagination as a child, and as films at that age tend to have a tendency of doing, it embedded itself into my brain as being nothing short of magical. Objectively I can see that there are flaws, yet for me when the maligned middle-aged Pan is played by Robin Williams, I’m happy to wait out the “I’m a lawyer” Peter Banning phase until we get to hear him crow. And whilst we’re waiting for Peter to get his act together, there’s the aforementioned stand-in leader of the Lost Boys, Rufio. Rufio, Rufio, Ru-Fi-O. An example to us all. Lookie lookie, he got Hookie, and met his maker all too soon. I mean, COME ON! Who doesn’t think this kid is just the absolute coolest?! 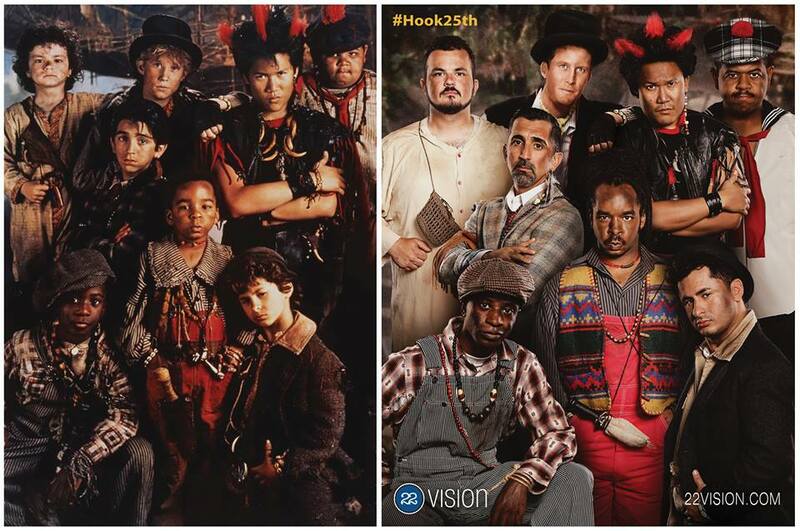 Having grown up watching Hook, these are the definitive versions of these characters for me. It’s impossible to think of Dustin Hoffman without thinking of that spectacularly moustached Captain Hook. Or Bob Hoskins without Smee springing to mind. Smee, Smee. What About Smee? I simply don’t have the same connection to the young, traditional Peter Pan. Robin Williams is, and will always be Pan to me. He can fly, he can fight, he can crow. Did you know that whenever someone says, “I don’t like Hook“, that there’s a little fairy somewhere that falls right down dead? Clearly those people just need a mother, very, very badly. Previous Post Giveaway: Win A Dozen Summers On DVD! Oh my God…how could anyone in the universe dislike this movie??? It’s such a timeless classic! Great post! I always loved this movie. It’s the moment I became a big Robin Williams fan. Same for me, I absolutely loved his Pan (and still do), what a hero! I just might have to watch it again. There’s always time for another cheeky Hook viewing!